The Salvation Army would once again like to sincerely thank the citizens of Windsor who contributed to our Christmas Campaign in 2015. With your help we were able to provide dignity and hope to thousands in our City in the past year. Whether it was a gift of time or resources – we couldn’t have done it without you. 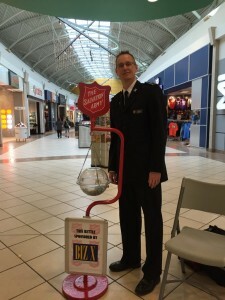 In the final days of the Christmas Kettle Campaign, The Salvation Army surpassed its $260,000 goal. “We are extremely grateful to the people of Windsor for their generosity and support of The Salvation Army, not only at Christmas, but all throughout the year”, says Perron Goodyear, Public Relations & Development Representative for The Salvation Army. “We are once again overwhelmed and humbled by the confidence shown in us during these extremely difficult economic times”. In addition to the individuals who continue to support the Christmas Kettle Campaign, numerous companies and business did so as well. Money raised during the Christmas Kettle Campaign helped support the most vulnerable in our City at Christmas and will continue to provide support through The Salvation Army’s Community & Family Services throughout the year.